Mitt Romney is almost certainly going to be the Republican presidential nominee. But as he looks toward the general election, his profound disconnect with Latino voters has generated growing concern within his campaign and across the Republican establishment. A recent Fox News Latino poll, for example, found that only 17.5 percent of Latino voters believed Romney actually cares about Latinos and Latino issues, while even fewer people—14 percent—would vote for him over President Barack Obama. Those dismal numbers of course are far below the estimated 40 percent of the Latino vote share that he would need to win the presidency. Now a fledgling two-part strategy to address this deficit is emerging from the Romney camp: attack the president’s failure to enact immigration reform and court a Latino running mate. Romney’s recent cynical offensive against the administration’s immigration policies suggests, however, that rather than try to court these voters with policy substance, he is content with trying to diminish enthusiasm and, presumably, voter turnout for his opponent. A barrage of conservatives tout first-term Sen. Marco Rubio (R-FL) as Romney’s potential lifeline to Latino voters. Sen. Rubio is cast as an appealing candidate to balance out the ticket—he is Catholic, Latino, telegenic, and from an important swing state. Last Thursday Jeb Bush told the Pittsburgh Tribune-Review that he believed Rubio should be the vice presidential pick, while a few days earlier Roll Call spoke to the increasing view that Rubio would energize the Republican ticket with the headline: “Who Else for Vice President but Marco Rubio?” In Wisconsin Romney recently stated that immigration reform “will be a priority of mine if I become president.” But what kind of reform and what sort of immigration agenda can we expect if Romney and Rubio are elected? Pursue a “DREAM-less” DREAM Act, which would grant legal status but no path to earn citizenship for unauthorized immigrants who were brought here at a young age. These legislative and administrative strategies would create burdensome and costly new regulations that would grow the size of the federal government at taxpayer expense, affect all Americans—immigrant and native born alike—undermine community safety, stifle economic growth, and rob the United States of a large pool of talent all while tearing families apart. These policies are also outside the mainstream of American public opinion on immigration. While legislative accomplishments are hard to come by or predict, it is likely that both a mandatory E-Verify program and a DREAM-less DREAM Act will be on a Romney-Rubio administration’s legislative agenda. Here’s why. Both Romney and Rubio talk about E-Verify as a solution to the nation’s undocumented immigration issue. Implementing a mandatory E-Verify program is not as simple as it sounds, however, and presents a number of challenges. First and foremost, the system’s error rates mean that more than three-quarters of a million legally authorized American workers—including citizens—would lose their jobs because of mismatches between their information and what is on file with the government. An additional 1.2 million to 3.5 million Americans would have to spend close to $200 of their own money in lost wages and transportation costs to travel to a Social Security Administration office to fix erroneous information or risk losing their jobs. And these errors disproportionately fall upon the foreign born: According to a Westat study, naturalized citizens are more than 30 times more likely to receive an error than U.S.-born citizens. All for a system that catches unauthorized immigrants only 46 percent of the time—meaning that more than half of unauthorized workers will get through the system without a problem. A mandatory E-Verify system would also cost a significant amount of money. According to the nonpartisan Congressional Budget Office, mandatory E-Verify use would decrease federal tax revenue by $17.3 billion over 10 years as workers move off the books and into the underground economy, where their tax revenue does not accrue to the government. Running a mandatory E-Verify system would cost the government more than $1 billion over five years, between the Department of Homeland Security and the Social Security Administration, while a recent Bloomberg Government study found that small businesses would bear the brunt of E-Verify’s costs, paying $2.6 billion a year to use the system. And while Romney in the Mesa, Arizona Republican Debate pointed to Arizona’s mandatory E-Verify law, passed in 2007, as a “model” for the nation, since, in his words, “the number of people in Arizona that are here illegally has dropped by some 14 percent,” the law had a number of unintended consequences. In particular, mandatory E-Verify caused a significant number of people in the state to move from the formal economy to the informal economy. A report on Arizona’s E-Verify law by the Public Policy Institute of California concluded that far more immigrants would move off the books with a federal mandatory E-Verify policy (where their tax revenues would not accrue to the government and where they would be more open to exploitation) than would move out of the country. Rubio has of late softened his strict opposition to the DREAM Act, but even he is unwilling to support the full DREAM Act. As he told Juan Williams last week, he bases his opposition on the misguided idea that the DREAM Act would cause further “chain migration” of unauthorized immigrants (where immigrants gain citizenship and then bring over their family members). The idea of mass chain migration is a myth: According to the most up-to-date projections by sociologist Bin Yu, the average immigrant brings only 2.1 family members to the United States over their lifetime. What’s more, this process occurs over decades—as former Immigration and Naturalization Service official Stuart Anderson has pointed out, it takes a minimum of 19 years for a U.S. citizen to bring an adult child from Mexico. Under the provisions of the DREAM Act, it would take at least 11 years just for an immigrant to obtain citizenship, a prerequisite to bringing one’s parents over—to say nothing about the availability of a visa. 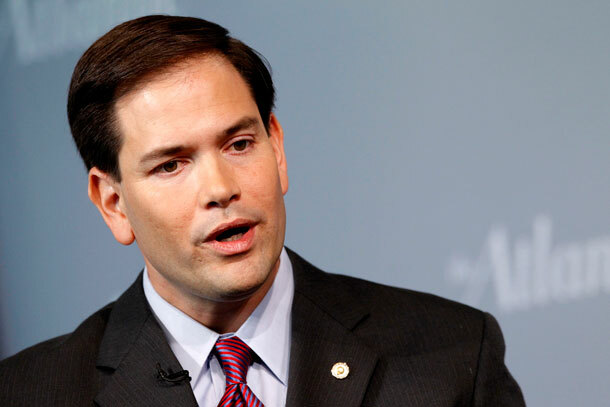 Nevertheless, Rubio has stated that he will support a version of the DREAM Act that gives legal status with no possibility of earning citizenship. Rubio’s plan would force the 2.1 million undocumented students into a second-class status for life instead of allowing them to become full and equal members of society. In short, a Romney-Rubio administration would end for good any possibility of passing the DREAM Act. While a Romney-Rubio administration will have to work with Congress to pass its legislative agenda, it can do a number of things through the executive branch from its first day in office. For instance, Romney has stated that he will encourage Arizona-style “papers please” laws in more states, make self-deportation federal policy, and build the entire border fence. Romney told the audience in the CNN Mesa, Arizona Republican debate that he would drop all government lawsuits against states like Arizona and their anti-immigrant laws. Notwithstanding the Supreme Court, which is set to hear arguments on the constitutionality of Arizona’s S.B. 1070 on April 25, stopping federal litigation against places like Arizona would give a green light to other states considering copycat bills. With the knowledge that they will not have to worry about federal government lawsuits, these states will be far more likely to pass their own versions of “papers please” laws, allowing the local police to check the status of anyone they suspect might be in the country without status. Since Romney advisor Kris Kobach deemed the Obama administration’s policy of prosecutorial discretion—allowing immigration officials to prioritize the worst of the worst in immigration enforcement and to ensure that people with no criminal record, or DREAM Act-eligible students, have their cases closed—an attempt to “go further in not enforcing the law,” it is not a stretch to say that President Romney will immediately rescind the policy of discretion. Without the ability to prioritize resources, the government will be forced to spend money deporting anyone who comes into the system even if they have been in the country for well over a decade, have a family here, and have committed no crime. While Romney states that he is in favor of self-deportation—where immigrants make the choice to leave on their own—rather than using government resources to deport the estimated 11.5 million unauthorized immigrants in the country, ending prosecutorial discretion will mean that far more people end up in deportation proceedings at an average cost to the government of $23,500 per deportation. Romney in particular is pushing an aggressive program of self-deportation as a centerpiece of his immigration policy. Romney’s ideas are based on those of his immigration advisor Kris Kobach, and would mean pursuing a strategy of attrition through enforcement, which restrictionist groups like NumbersUSA define as “mak[ing] it extremely difficult for unauthorized persons to live and work in the United States,” in the hope that they will leave the country on their own. But how would such a self-deportation program play out in real life? Most importantly, it would not solve the problem of undocumented immigration. According to the Department of Homeland Security, most undocumented immigrants have been in the country for 10 years or more, and the Pew Hispanic Center estimates that 47 percent of unauthorized immigrants live in households comprised of families with children. This makes it highly unlikely that they will simply leave the country. In a recent report, researcher Leah Muse-Orlinoff of the University of California, San Diego reviewed the evidence from states like Arizona, which has had a mandatory E-Verify law on its books since 2007, and places like Oklahoma City that have passed similar anti-immigrant ordinances. She concluded that “unauthorized immigrants make the decision to stay in the country despite attempts to drive them out,” with some moving to a more welcoming locale within the United States and many more simply going underground. But while these laws do not drive immigrants out of the country, self-deportation does wreak havoc on the communities where it is implemented. As Eliseo Medina, secretary-treasurer of the Service Employees International Union pointed out after the Florida debate, implementing self-deportation means “refusing to rent to them [undocumented immigrants] or to provide access to heat and water,” not to mention going after their children in schools. We only have to look at Alabama to see the disastrous consequences of self-deportation policies. The state passed its own version of an attrition-through-enforcement bill, H.B. 56, in June 2011 and it went into effect in September. On the first Monday after the law went into effect over 2,000 Latino students did not show up to school because many unauthorized immigrants were fearful of arrest under the new law. The Southern Poverty Law Center set up a helpline for people to report racial profiling and abuses under H.B. 56 and it received over 2,000 calls in its first week of operation. What’s more, lack of available immigrant laborers threatens to devastate Alabama’s $5.5 billion agricultural sector, while the recent arrest of two foreign auto executives calls into question the state’s status as a leader in attracting foreign investment. Overall, economist Samuel Addy of the Center for Business and Economic Research at the University of Alabama estimates that the state could lose up to $10.8 billion annually and up to 140,000 jobs from H.B. 56. Tough talk aside, according to government estimates 81 percent of the border already falls within the top tiers of operational control, meaning that at the very least the Department of Homeland Security can detect all attempts to cross. The remaining 19 percent is in the most inaccessible parts of the border. That 81 percent includes 650 miles of fencing and an extensive use of technology to detect border crossings. To build a fence along the entire border—enlarging it from 650 to 2,000 miles—would be impractical at best and extremely costly at worst. The Government Accountability Office estimated that it would cost on average $3.9 million per mile to build the most secure type of fence (primary pedestrian fencing), meaning that it would cost the government a whopping $5.3 billion of taxpayer funds to complete the fence. At a time of tightening wallets and cutting spending a $5.3 billion price tag certainly runs contrary to the idea of small government. Poll after poll finds Romney and Rubio’s positions to be far outside the mainstream of American voters. Instead of harsh and costly enforcement-only laws, most Americans favor a balanced approach where tougher enforcement is paired with a pathway to citizenship for people who are part of our communities, allowing them to learn English and pay back taxes. These results are consistent regardless of who is asking the question. A Fox News poll from December 2011, for example, found that two-thirds of all voters believed that unauthorized immigrants should be allowed to remain in the country and eventually stay in the country, while only 19 percent supported sending all unauthorized immigrants back to their home country. On the flip side, a Latino Decisions/Univision News poll from November 2011 found that only 25 percent of the general public would be more likely to support a candidate with harsh views on immigration, while 41 percent would be less likely. By contrast, 46 percent of voters would be more likely to support a candidate with positive views on immigration and only 15 percent would be less likely. The DREAM Act polls equally high, with 58 percent of all voters and 91 percent of Latino voters favoring it. Voters should ask themselves whether they want to support a potential administration with immigration positions far more extreme than their own. Voters should ask themselves whether they want to support a potential administration with immigration positions far more extreme than their own. Do they support candidates who would reject the DREAM Act, push self-deportation and E-Verify on the nation, and make Arizona a model for the country at large? Do they support the purported “small government” candidate who would spend over $5 billion to build a fence, spend billions of dollars more in deportation and enforcement costs, and lower government revenues by $17.3 billion over a decade through mandatory E-Verify use? Because that’s what they’d get with the Romney-Rubio ticket. Angela Maria Kelley is Vice President for Immigration Policy and Advocacy, Philip E. Wolgin is Immigration Policy Analyst, and Ann Garcia is Research and Policy Associate at the Center for American Progress Action Fund.